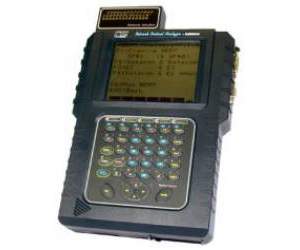 The HCT-7000 is a portable, battery powered communication tester, designed for a wide range of protocol analysis and BERT (Bit Error Rate Test) at full E1 speeds (2.048Mbps) and is fully suitable for equipment installations, on-line or off-line diagnostics, debugging, and interface development. The HCT-7000 features a backlit Liquid Crystal Display (LCD), push-button switch keyboard, interface lead indicator LEDs, PCMCIA card slot, user replaceable data port interface modules and internal rechargeable Li- Ion battery. The unit includes the Basic Interfaces, basic operational firmware, comprehensive User Guide, universal AC power adapter (100~240 VAC) and a sturdy hard shell carry case.